Certains revirements surprennent, mais la mécanique à vue et la tension mal soutenue desservent le sujet d'une brûlante actualité: la corruption de l'appareil politique. In the end, a film is only measured by how enjoyable it actually is to watch, and on that count Broken City is closer to failure than it is to mediocrity. Si Broken City ne réinvente pas le genre et n'a pas la profondeur ni l'efficacité d'un film comme The French Connection, l'oeuvre a le mérite d'aborder des thèmes actuels avec finesse et intelligence, et de ne trop tomber dans le manichéisme. 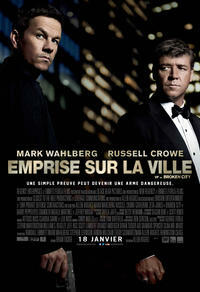 As much of a problem I had with the storytelling aspect of Broken City, it certainly is a nice looking film. Hughes has a way of creating some incredibly interesting shots which is evident from the very first scene. Another January dud. Broken City drops hot-shot actors in a quicksand of clichés and watches them sink. For just about all of its 109 minutes, it is readily apparent a whole lot of things have gone wrong with Broken City, and they started long before a frame of footage was shot. Une fois qu'on accepte son intrigue sans queue ni tête, Broken City est un film divertissant qui sait trouver un équilibre entre ses touches d'humours et ses moments plus sombres. Hughes' direction is haphazard; some scenes seem perfunctory - even useless - others never find their dramatic centers, a few are all right. Everyone involved here has made and will make vastly better films. Time to deposit that paycheque and move on.